After helping Swansea rise from the fourth tier to the Premier League, Leon Britton says it is "unbelievable" to be playing for a place in Europe. The Swans face League Two Bradford in the Capital One Cup final at Wembley on Sunday with the winners taking a place in the Europa League next season. "It's just crazy isn't it to think the Swans could be in Europe," said 30-year-old midfielder Britton. "It's unbelievable to see how far the club has come." Britton was on loan at Swansea when they beat Hull City 4-2 in the last game of the 2002-03 season to keep their place in the Football League. He signed for the Swans in August that year and apart from six months at Sheffield United in 2010 has been at the club ever since. "We're talking about a major cup final here with a chance to reach Europe - I've seen a lot of progression in the club for the past 10 years," he said. "I know we hark back, but 10 years ago who would have thought we could qualify for Europe by winning a major honour? "It would be an unbelievable experience for everyone to get to Europe, but obviously there's 90 minutes of football to be played yet." 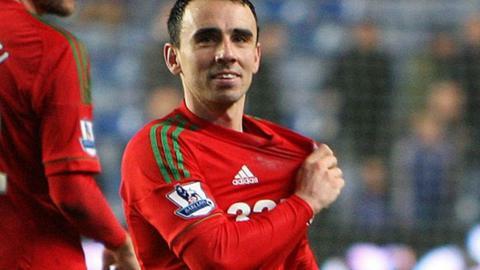 Britton is grateful Swansea gave him a second chance after his move to Sheffield on a free in the summer of 2010. The player struggled to settle at Bramall Lane and was re-signed by the Swans in January 2011 for £400,000. "I'm very lucky," said Britton. "I remember coming back here and thinking how lucky I was that after six months the Swans took me back. "I do count my lucky stars when I go to bed at night. "Football can change so quickly. I moved to Sheffield United, it didn't work out, and thankfully I came back. "But things could have been so different I could still be there and playing in League One when Swansea are playing in the Premier League and a major cup final. "I would be a little bit jealous."